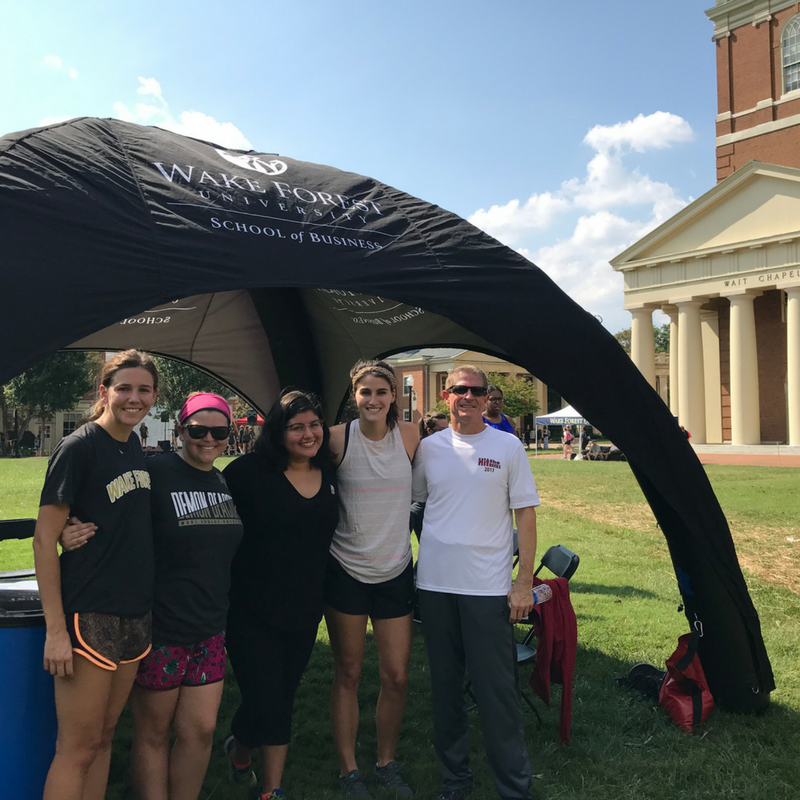 Graduate teams from the Wake Forest School of Business participated in Hit the Bricks this Thursday, sprinting laps around Hearn Plaza to raise money for cancer research. For the third consecutive year, a School team placed first in the graduate division. Congratulations to the M.S. in Accounting “Fraud Squad” team, which passed the School of Law team by 15 laps. This year, four teams represented the School with more than 50 participants. Two MSA teams, one M.S. in Business Analytics team, and one faculty and staff team all supported one another as they both ran and walked around the quad. Members take turns wearing weighted backpacks while they earn laps around the quad. The Hit the Bricks tradition was started by two Wake Forest students in 2003 to support the Brian Piccolo Cancer Research Fund, which supports patients and their families at the Wake Forest Baptist Medical Center’s Comprehensive Cancer Center. The Masters in Management students are participating in a two-day case competition and were not able to form a team. Still, they showed their support by arriving early to the event to set up the tent for their graduate student peers, and by taking down the tent at the end of the day. Alyssa Frizzelle is a three-semester MSA student and captained one of the MSA teams. Her role included advertising the event, promoting interest, and increasing participation. She also worked with the student engagement council treasurer to organize a bake sale to raise money for the event ahead of time. Frizelle said that she loved how many students across Wake Forest’s many different departments and programs participated in the event. Jim Willis, associate dean of the Master of Science in Accounting program and a professor of the practice is beginning his fifth year as a member of the Wake Forest faculty. He took turns running laps with his students. Since its beginning, Hit the Bricks participants have run more than 254,032 laps and raised $329,843. Over $3 million total has been raised for the Brian Piccolo Research Fund since 1980.